Marina Picasso (no. 02556), by descent from the above. Gerald Peters Gallery, Santa Fe, by whom acquired from the above. Private collection, Dallas, by whom acquired from the above on 18 March 1999. The Picasso Project (ed. ), Picasso's Paintings, Watercolors, Drawings and Sculpture. A Comprehensive Illustrated Catalogue - 1885-1973, From Cubism to Neoclassicism, 1917-1919, San Francisco, 1995, no. 19-362 (illustrated p. 282). Geneva, Galerie Jan Krugier, Picasso. Oeuvres cubistes de la Collection Marina Picasso, May - August 1986, no. 166. Barcelona, Fondación Caixa de Barcelona, Picasso cubista 1907-1920. Collectión Marina Picasso, May - July 1986, no. 15. New York, Jan Krugier Gallery, Pablo Picasso: Cubist works from the Marina Picasso Collection, October 1987, p. 112, no. 44 (illustrated). Tokyo, Tokyo Station Gallery, Pablo Picasso: Focus on Cubist Works from the Marina Picasso Collection, June - September 1988, no. 33. Jerusalem, The Israel Museum, Picasso the Draughtsman. 103 Works from the Marina Picasso Collection, September - November 1993, no. 44. Santa Fe, Gerald Peters Gallery, Picasso on Paper: Selected Works from the Marina Picasso Collection, August - December 1998 (illustrated fig. 3). This work is sold with a photo-certificate from Maya Widmayer PIcasso, and one from Claude Ruiz Picasso. By late 1919 Picasso had been working alternately-- and, indeed, controversially-- in two styles for several years. He continued to paint in his cubist idiom, usually taking still-lifes as his subjects. He generally preferred to treat the figure in his newer classicizing manner, looking to Ingres and late Renoir as his models. In a small number of works, however, such as the present one, he rendered the figure in the flattened and overlapping planes of late synthetic Cubism, continuing in the line of his wartime masterpiece, Arlequin, which he painted in late 1915 (C. Zervos, vol. 2**; no. 555; fig. 1). 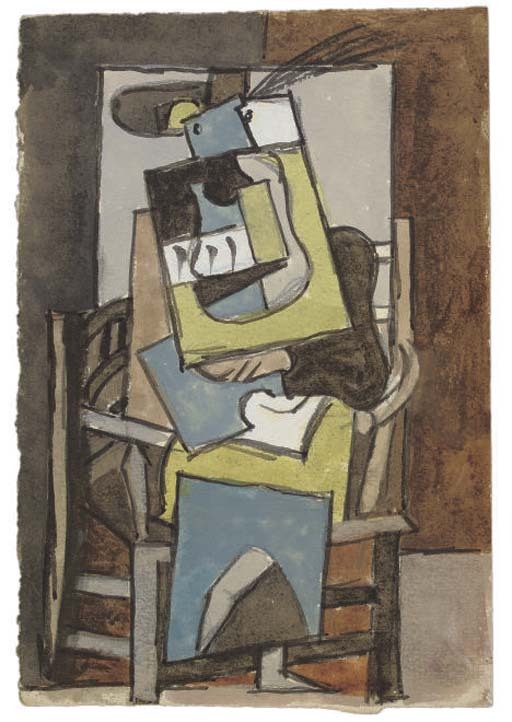 Picasso's cubist and classical styles each attracted its own partisans, and this polarization was further aggravated when the two Rosenberg brothers held exhibitions in 1919. Léonce Rosenberg included only cubist works by Picasso in a group installation at his Galerie de L'Effort Moderne in June. Paul Rosenberg, whose gallery was down the street from Leonce's, and next door to Picasso's new residence on the upscale rue la Boëtie, held a large one-man show in October of Picasso's drawings and watercolors, which emphasized his classicizing approach. One camp of critics, on the lookout for a new postwar style, and following Jean Cocteau's postwar 'call to order,' thought that cubism was by now old hat and no longer suited the changing times. The other side, including many major artists working in cubist modes, looked upon Picasso's classical works as an outright betrayal of the avant-garde. Few considered how one approach might be seen to influence and complement the other. Picasso put it most simply in a statement to Marius de Zayas, which anticipates the pluralism of our own postmodern era: 'I do not believe I have used radically different elements in the different manners I have used in painting. If the subjects I have wanted to express have suggested different ways of expression I have never hesitated to adopt them... Whenever I have something to say, I have said it in the manner in which I have felt it ought to be said. Different motives inevitably require different methods of expression. This does not imply either evolution or progress, but an adaptation of the idea one wants to express and the means to express that idea' (in 'Picasso Speaks,' The Arts, New York, May 1923; reprinted in D. Ashton, Picasso on Art, New York, 1972, p. 5). When Picasso chose to depict the figure in cubist forms during this period, whether in Arlequin or the present Femme au chapeau à plume, the results often display a delightful sense of humour and whimsy. This stems from the fact that the artist was essentially treating the figure as a still-life, in which he supplanted the supple and organic form of the human body with incongruously angular and constructively mechanical elements. Picasso executed the present watercolour on the heels of his important series of tables set with still-life objects and placed before an open window, which occupied him during his late summer vacation with his wife Olga in Saint-Raphaël on the Riviera. The rectangular window backdrop is visible here as well. The sitter in this watercolor is surely Olga, attired as she might have appeared in the reception she hosted for her husband and his friends in their home following the close of the Galerie Paul Rosenberg exhibition on 21 November. There are two drawings of Olga wearing feathered hats rendered in a classical linear style which Picasso made around this time and in early 1920 (see Zervos, vol. 29, no. 442 [dated 28-XI-1919]; and Zervos, vol. 4, no. 91, in the Musée Picasso). Coincidently, there was the series of drawings of young women in plumed hats that Matisse had done in Nice in 1918-1919, of which Picasso was probably unaware, until Matisse published them in his Cinquante dessins in 1920.